Cubeb is a perennial vine or shrub; the round branches of the creeping or climbing stem are ash-gray and take root at the joints. The leaves are smooth, oblong-ovate, and pointed. The flowers grow in smooth, scaly spikes, developing into a cluster of berries. Cubebs are dried, unripe berries, which look like black pepper. 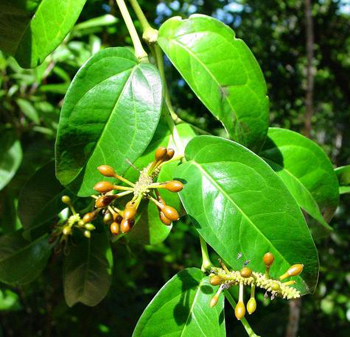 Grows in the forests of Penang, Java, Sumatra, New Guinea, and he neighboring islands. Usually grows extensively in plantations under the shade of coffee trees. Cubebs were first introduced into Europe by Arabians as pepper with tails; so called because of the short stem attached to the fruit. The King of Portugal forbade imports of this new kind of pepper for fear it should spoil the sail of other pepper. The odor of cubeb is agreeably aromatic. The taste warm, bitterish, and camphorous, leaving in the mouth a peculiar sensation of coolness like that produced by the oil of peppermint. 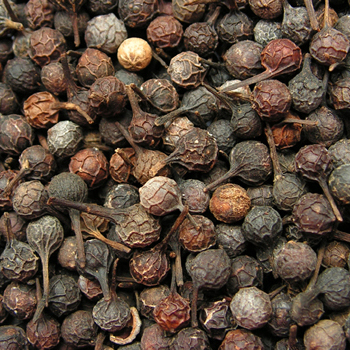 Cubeb is used mainly as an ingredient in French medicated gin bitters. Cubeb berries add flavor and certain qualitites to tobacco or botanical mixtures. Once widely offered in cigarettes as a medicinal smoke. Helps indigestion, catarrh, bronchitis, coughs, and lung problems. Cubeb cigarettes are said to relieve hay fever, asthma, and pharyngitis. Cubeb oil is useful for urinary ailments and acts as an antiseptic against gonorrhea, syphilis, chronic bladder troubles, burning urine, leukorrhea, colic. Cubeb gives tone to stomach and bowels, increases the flow of urine, relieves join pains, gleet (penile discharge), abscesses of the prostate gland, and hemorrhoids. Has been used largely for seasoning soups. The whole berries are chewed for offensive breath. Infusion: steep 1 tsp. cubebs in 1 cup water. Take hot or cold, a mouthful 3 times a day or 1/2 cup when going to bed. Fluid extract: take 1/4 to 1 tsp. in a glass of water. Oil: a dose is 5-15 drops. Powder: a dose is 1/2 to 2 tsp.